Graeme Edge, British drummer and songwriter with the Moody Blues was born 30th March 1941. 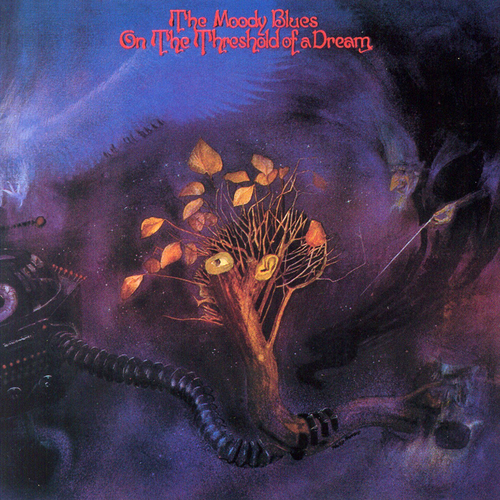 The Moody Blues formed on 4 May 1964, in Erdington, Birmingham, England containing Ray Thomas, John Lodge, Graeme Edge and Michael Pinder The name developed from a hoped-for sponsorship from the M&B Brewery which failed to materialise and was also a subtle reference to the Duke Ellington song, “Mood Indigo. They released a single, “Steal Your Heart Away” in 1964 and appeared on the cult UK series “Ready Steady Go!” singing the uptempo “Lose Your Money (But Don’t Lose your Mind)”. But it was their second single, “Go Now” which launched their career & became a hit in the United Kingdom. Their debut album The Magnificent Moodies had a strong Merseybeat/R&B flavour. It contained the hit singles “Go Now” and “Bye Bye Bird” together with one side of classic R&B covers. including a cover of “I Don’t Want To Go On Without You”,”From The Bottom of My Heart (I Love You)”, “Everyday”,”This is My House (But Nobody Calls)” and and “Boulevard de la Madeleine”. In 1967 The group released the singles “Fly Me High”, “Really Haven’t Got the Time”, “Love And Beauty” & “Leave This Man Alone”. The Moody Blues were then offered a deal to make a rock and roll version of Antonín Dvořák’s New World Symphony, and although executives were initially skeptical about the hybrid style of the resulting concept album. Days of Future Past became one of the most successful pop/rock releases of the period, earning a gold record award. It takes place over the course of a single day & drew inspiration from the pioneering use of the classical instrumentation by The Beatles. It includes the songs “Nights in White Satin” & “The Sun Set” “Another Morning”, “Twilight Time”,”Peak Hour” and “Evening (Time To Get Away)”. The 1968 follow-up LP, In Search of the Lost Chord included the songs “Legend of a Mind”,”House of Four Doors”,”Voices in the Sky”, “Ride My See-Saw” and “The Best Way To Travel”. The Moodies were also among the pioneers of the idea that a successful rock band could promote itself through their own label, so following the Beatles’ creation of Apple Records, they created Threshold Records. However it proved unsuccessful although They did lay the groundwork for other major acts to set up similar personal labels and distribution deals including The Rolling Stones’ own label and Led Zeppelin’s Swan Song Record label.In the spring of 1974, after completing a vast world tour that culminated with a tour of Asia, the group took an extended break and released a compilation album This Is The Moody Blues. Justin Hayward and John Lodge then released the album, Blue Jays, and a single, “Blue Guitar”. Mike Pinder released a album The Promise.” Edge produced two albums with guitarist Adrian Gurvitz, Kick Off Your Muddy Boots and Paradise Ballroom; Hayward composed the albums Songwriter, followed by Night Flight, Moving Mountains, Classic Blue, The View From The Hill and Live In San Juan Capistrano; Lodge released Natural Avenue; Pinder produced The Promise; and Thomas produced From Mighty Oaks and Hopes, Wishes and Dreams. In 1977, the group reunited and despite many problems The album Octave was released in 1978 contining “Steppin’ in a Slide Zone” & “Driftwood”. Justin Hayward enjoyed a solo hit with the song “Forever Autumn” from Jeff Wayne’s Musical Version of The War of the Worlds.The Moodies toured the US and Europe during much of 1979. The next album ,Long Distance Voyager,was released in 1981 and yielded two hits, “The Voice” &”Gemini Dream”. and the band embraced a more modern, less symphonic approach, while still retaining a lush keyboard-led sound. The next album The Present yeilded the singles “Blue World” and”Sitting at the Wheel”. In 1986 they released the album The Other Side of Life, containing “Your Wildest Dreams”which garnered a Billboard Video of the Year award,as well as the songs “House of Four Doors”, “Candle of Life” and “One More Time To Live” “Here Comes The Weekend”, “Rock and Roll Over You”, “Love is On The Run (From Me)”, “The Actor”, “Dawning is the Day”, “You Can Never Go Home”& “The Land of Make Believe”. The Moody Blues also performed live at the Birmingham Heart Beat Charity Concert 1986 which raised money for the Birmingham Children’s Hospitals, and also provided backup with the Electric Light Orchestra for George Harrison.The Moodies released Sur La Mer in 1988 containing the single, “I Know You’re Out There Somewhere”. Prolific post-Impressionist painter Vincent Willem van Gogh was born 30th March 1853, his work is notable for its rough beauty, emotional honesty and bold color, had a far-reaching influence on 20th-century art. . His work was then known to only a handful of people and appreciated by fewer still. Van Gogh began to draw as a child, and he continued to draw throughout the years that led up to his decision to become an artist. He did not begin painting until his late twenties, completing many of his best-known works during the last two years of his life. In just over a decade, he produced more than 2,100 artworks, consisting of 860 oil paintings and more than 1,300 watercolors, drawings, sketches and prints. His work included self portraits, landscapes, still lifes, portraits and paintings of cypresses, wheat fields and sunflowers. Van Gogh spent his early adulthood working for a firm of art dealers, traveling between The Hague, London and Paris, after which he taught for a time in England. One of his early aspirations was to become a pastor and from 1879 he worked as a missionary in a mining region in Belgium where he began to sketch people from the local community. In 1885, he painted his first major work The Potato Eaters. His palette at the time consisted mainly of somber earth tones and showed no sign of the vivid coloration that distinguished his later work. In March 1886, he moved to Paris and discovered the French Impressionists. Later, he moved to the south of France and was influenced by the strong sunlight he found there. 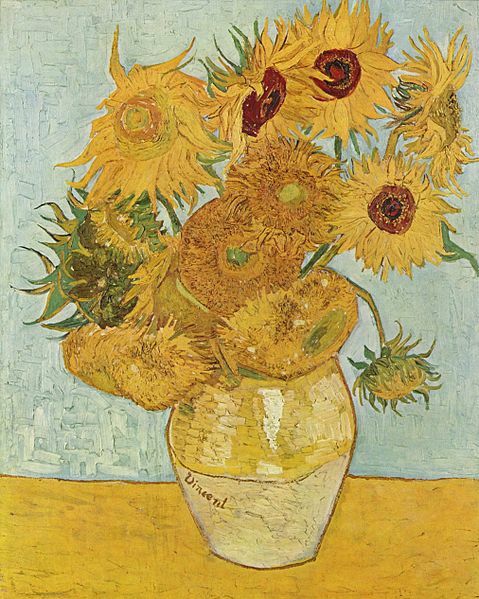 Sadly After suffering years of painful anxiety and frequent bouts of mental illness, Van Goch tragically died on 29 July 1890 at the age Of 37 in Auvers-sur-Oise, France from a gunshot wound, which is generally accepted to be self-inflicted (although no gun was ever found). Mark McClelland, Irish musician with Snow Patrol, Little Doses, and The Reindeer Section was born 30th March 1976. Formed at the University of Dundee in 1994. Snow Patrol comprises Gary Lightbody (vocals, guitar), Jonny Quinn (drums), Dutch Connolly (guitar, backing vocals), Paul Wilson (bass guitar, backing vocals), and Tom Simpson (keyboards). Initially an indie rock band, their first three records, the EP Starfighter Pilot (1997), and the studio albums Songs for Polarbears (1998) and When It’s All Over We Still Have to Clear Up (2001), were commercially unsuccessful and were released by the independent labels Electric Honey and Jeepster respectively. The band then signed on to the major record label Polydor Records in 2002. Snow Patrol rose to national fame with their major label debut, Final Straw, in 2003. The album was certified 5× platinum in the UK and eventually sold over 3 million copies worldwide thanks to songs like Run. Their next studio album, Eyes Open, (2006) and its hit single “Chasing Cars,” propelled the band to greater international fame. The album topped the UK Album Charts and was the best-selling British album of the year, selling over 6 million copies worldwide. In 2008, the band released their fifth studio album A Hundred Million Suns, then in 2009 their first compilation album, Up to Now and in 2011 they released their sixth studio album Fallen Empires. During the course of their career, Snow Patrol have won five Meteor Ireland Music Awards and have been nominated for three BRIT Awards. Since the release of Final Straw, the band have sold over ten million Albums. English musician, singer songwriter Eric Patrick Clapton, CBE, was born 30 March 1945. He is the only three-time inductee to the Rock and Roll Hall of Fame: once as a solo artist and separately as a member of the Yardbirds and Cream. Clapton has been referred to as one of the most important and influential guitarists of all time. Clapton ranked second in Rolling Stone magazine’s list of the “100 Greatest Guitarists of All Time” and fourth in Gibson’s “Top 50 Guitarists of All Time”. Clapton started playing guitar after receiving an acoustic Hoyer guitar, made in Germany, for his thirteenth birthday, but briefly lost interest.Two years later Clapton picked it up again and started playing consistently. Clapton was influenced by the blues from an early age. In 1961, after leaving Hollyfield School in Surbiton, Clapton studied at the Kingston College of Art but was dismissed at the end of the academic year because his focus remained on music rather than art. His guitar playing was so advanced that, by the age of 16, he was getting noticed and began busking around Kingston, Richmond, and the West End. In1962, Clapton started performing as a duo with fellow blues enthusiast David Brock in pubs around Surrey. When he was seventeen years old, Clapton joined his first band, an early British R&B group, the Roosters, whose other guitarist was Tom McGuinness. He stayed with this band from January through August 1963.In October of that year, Clapton did a seven-gig stint with Casey Jones & the Engineers. In October 1963, Clapton joined The Yardbirds, a blues-influenced rock and roll band, and stayed with them until March 1965. Synthesising influences from Chicago blues and leading blues guitarists such as Buddy Guy, Freddie King, and B. B. King, Clapton forged a distinctive style and rapidly became one of the most talked-about guitarists in the British music scene.The band initially played Chess/Checker/Vee-Jay blues numbers and began to attract a large cult following when they took over the Rolling Stones’ residency at the Crawdaddy Club in Richmond. They toured England with American bluesman Sonny Boy Williamson II; a joint LP album, recorded in December 1963, was issued in 1965. He gained the nickname slowhand because whenever He broke a guitar string during a concert, he would stay on stage and replace it and The English audiences would do a “slow handclap”. The nickname of ‘Slowhand’ was coined by Giorgio Gomelsky, who said Clapton was a fast player, so he put together the slow handclap phrase into Slowhand as a play on words”. In March 1965 the Yardbirds had their first major hit, “For Your Love”, which was written by pop songwriter-for-hire Graham Gouldman (who would achieve success as a member of 10cc). Still musically devoted to the blues, Clapton was opposed to the move, and left the band. He recommended fellow guitarist Jimmy Page as his replacement, but Page declined out of loyalty to Clapton, putting Jeff Beck forward. While Beck and Page played together in the Yardbirds, although the trio of Beck, Page, and Clapton were never in the group together. In April 1965 Clapton joined John Mayall & the Bluesbreakers , quitting shortly afterwards and rejoining In November 1965 and gained world fame as the best blues guitarist which inspired a well-publicised graffito that deified him with the famous slogan “Clapton is God”. The phrase was spray-painted by an admirer on a wall in an Islington Underground station in the autumn of 1967. The graffiti was captured in a now-famous photograph, in which a dog is urinating on the wall and. The phrase began to appear in other areas of Islington throughout the mid-1960s. Clapton left the Bluesbreakers in July 1966 (to be replaced by Peter Green) and was invited by drummer Ginger Baker to play in his newly formed band Cream, one of the earliest supergroups, with Jack Bruce on bass (previously of the Bluesbreakers, the Graham Bond Organisation and Manfred Mann). During his time with Cream, Clapton began to develop as a singer, songwriter, and guitarist and Cream established its enduring legend with the high-volume blues jamming and extended solos of their live shows. By early 1967, as fans of the emerging blues-rock sound in Britain had begun to portray Clapton as Britain’s top guitarist; however, he found himself rivalled by the emergence of Jimi Hendrix, who attended a performance of the newly formed Cream at the Central London Polytechnic. Top UK stars, including Clapton, Pete Townshend, and members of The Rolling Stones and The Beatles, avidly attended Hendrix’s early club performances. Cream’s repertoire varied from hard rock (“I Feel Free”) to lengthy blues-based instrumental jams (“Spoonful”). Together, Cream’s talents secured them as an influential power trio and they went on to, sell millions of records and redefined the instrumentalist’s role in rock and were one of the first blues-rock bands to emphasise musical virtuosity and lengthy jazz-style improvisation sessions. Though Cream was hailed as one of the greatest groups of its day, it was short-lived. Drug and alcohol use escalated tension between the three members, and conflicts between Bruce and Baker eventually led to Cream’s demise. Clapton’s next group, Blind Faith (1969), was composed of Cream drummer Ginger Baker, Steve Winwood of Traffic, and Ric Grech of Family, and yielded one LP which consisted of just six songs, one of them a 15-minute jam entitled “Do What You Like”. Sadly Blind Faith dissolved after less than seven months and Clapton subsequently toured for Delaney and Bonnie and The Plastic Ono Band, played lead guitar on Lennon’s second solo single, Cold Turkey and performed with John Lennon, George Harrison, and others at a fundraiser for UNICEF in London. Clapton recorded his first solo album With Delaney Bramletts’ backing group and an all-star cast of session players (including Leon Russell and Stephen Stills), which was entitled Eric Clapton and featured the songs Let It Rain” andJ. J. Cale’s “After Midnight”. Clapton also helped record George Harrison’s All Things Must Pass in spring 1970 and also recorded with other artists including Dr. John, Leon Russell, Plastic Ono Band, Billy Preston, Stephen Stills, Ringo Starr and Dave Mason, and played guitar on “Go Back Home” from Stephen Stills’ self-titled first solo album. Clapton then assembled a new band composed of Delaney and Bonnie’s former rhythm section, Bobby Whitlock as keyboardist and vocalist, Carl Radle as the bassist, and drummer Jim Gordon, with Clapton playing guitar.The band was originally called “Eric Clapton and Friends”. The name “Derek and the Dominos” was a fluke that occurred when the band’s provisional name of “Del and the Dynamos” was misread as Derek and the Dominos. Clapton’s close friendship with George Harrison brought him into contact with Harrison’s wife, Pattie Boyd, with whom he became deeply infatuated. When she spurned his advances, Clapton’s unrequited affections prompted most of the material for the Dominos’ album, Layla and Other Assorted Love Songs (1970). Heavily blues-influenced, the album features the twin lead guitars of Duane Allman and Clapton and the songs “Tell the Truth”, “Nobody Knows You When You’re Down and Out”, “Key to the Highway”, “Have You Ever Loved a Woman”, “Why Does Love Got to be So sad”,”I Looked Away”, “Bell Bottom Blues”, “Keep on Growing”, “I am Yours”, “Anyday”, and “It’s Too late”. Best known as the author of the classic novel Black Beauty, English Novellist Anna Sewell was born 30 March 1820 in Great Yarmouth, Norfolk. When Anna was twelve, the family moved to Stoke Newington where she attended school for the first time. Two years later, however, she slipped while walking home from school and severely injured both of her ankles. Her father took a job in Brighton in 1836, in the hope that the climate there would help to cure her. Despite this, and most likely because of mistreatment of her injury, for the rest of her life Anna was unable to stand without a crutch or to walk for any length of time. For greater mobility, she frequently used horse-drawn carriages, which contributed to her love of horses and concern for the humane treatment of animals. At about this time, both Anna and her mother left the Society of Friends to join the Church of England, though both remained active in evangelical circles. Her mother expressed her religious faith most noticeably by authoring a series of evangelical children’s books, which Anna helped to edit, though all the Sewells, and Mary Sewell’s family, the Wrights, engaged in many other good works. While seeking to improve her health in Europe, Sewell encountered various writers, artists, and philosophers, to which her previous background had not exposed her. Sewell’s only published work was Black Beauty, written during 1871 to 1877, after she had moved to Old Catton, a village outside the city of Norwich in Norfolk. During this time her health was declining. She was often so weak that she was confined to her bed and writing was a challenge. She dictated the text to her mother and from 1876 began to write on slips of paper which her mother then transcribed. Sewell sold the novel to local publisher Jarrolds on 24 November 1877, when she was 57 years of age. Although it is now considered a children’s classic, she originally wrote it for those who worked with horses. She said “a special aim was to induce kindness, sympathy, and an understanding treatment of horses”. Sewell died on 25 April 1878 of hepatitis or tuberculosis, five months after her book was published, living long enough to see its initial success. She was buried on 30 April 1878 in the Quaker burial-ground at Lammas near Buxton, Norfolk, not far from Norwich, where a wall plaque now marks her resting place and Her birthplace in Church Plain, Great Yarmouth, has been the home to a museum and tea shop. Good Friday is a Christian holiday commemorating the crucifixion of Jesus Christ and his death at Calvary. It is observed during Holy Week as part of the Paschal Triduum on the Friday preceding Easter Sunday, and may coincide with the Jewish observance of Passover. It is also known as Holy Friday, Great Friday, Black Friday, or Easter Friday though the last term properly refers to the Friday in Easter week. The date of the holiday on the Gregorian calendar varies from one year to the next, and there is disagreement about its calculation. It is a widely instituted legal holiday around the world, including in most Western countries and 12 U.S. states. Some countries, such as Germany, have laws prohibiting certain acts, such as dancing and horse racing, that are seen as profaning the solemn nature of the day. According to the accounts in the Gospels, the Temple Guards, guided by Jesus’ disciple Judas Iscariot, arrested Jesus in the Garden of Gethsemane. Judas received money (30 pieces of silver) (Matthew 26:14–16) for betraying Jesus and told the guards that whomever he kisses is the one they are to arrest. Following his arrest, Jesus was taken to the house of Annas, the father-in-law of the high priest, Caiaphas. There he was interrogated with little result and sent bound to Caiaphas the high priest where the Sanhedrin had assembled (John 18:1–24). Conflicting testimony against Jesus was brought forth by many witnesses, to which Jesus answered nothing. Finally the high priest adjured Jesus to respond under solemn oath, saying “I adjure you, by the Living God, to tell us, are you the Anointed One, the Son of God?” Jesus testified ambiguously, “You have said it, and in time you will see the Son of Man seated at the right hand of the Almighty, coming on the clouds of Heaven.” The high priest condemned Jesus for blasphemy, and the Sanhedrin concurred with a sentence of death (Matthew 26:57–66). Peter, waiting in the courtyard, also denied Jesus three times to bystanders while the interrogations were proceeding just as Jesus had predicted. In the morning, the whole assembly brought Jesus to the Roman governor Pontius Pilate under charges of subverting the nation, opposing taxes to Caesar, and making himself a king (Luke 23:1–2). Pilate authorized the Jewish leaders to judge Jesus according to their own law and execute sentencing; however, the Jewish leaders replied that they were not allowed by the Romans to carry out a sentence of death (John 18:31). Pilate questioned Jesus and told the assembly that there was no basis for sentencing. Upon learning that Jesus was from Galilee, Pilate referred the case to the ruler of Galilee, King Herod, who was in Jerusalem for the Passover Feast. Herod questioned Jesus but received no answer; Herod sent Jesus back to Pilate. Pilate told the assembly that neither he nor Herod found guilt in Jesus; Pilate resolved to have Jesus whipped and released (Luke 23:3–16). Under the guidance of the chief priests, the crowd asked for Barabbas, who had been imprisoned for committing murder during an insurrection. Pilate asked what they would have him do with Jesus, and they demanded, “Crucify him” (Mark 15:6–14). Pilate’s wife had seen Jesus in a dream earlier that day, and she forewarned Pilate to “have nothing to do with this righteous man” (Matthew 27:19). Pilate had Jesus flogged and then brought him out to the crowd to release him. The chief priests informed Pilate of a new charge, demanding Jesus be sentenced to death “because he claimed to be God’s son.” This possibility filled Pilate with fear, and he brought Jesus back inside the palace and demanded to know from where he came (John 19:1–9). Joseph of Arimathea, a member of the Sanhedrin and secret follower of Jesus, who had not consented to his condemnation, went to Pilate to request the body of Jesus (Luke 23:50–52). Another secret follower of Jesus and member of the Sanhedrin named Nicodemus brought about a hundred-pound weight mixture of spices and helped wrap the body of Jesus (John 19:39–40). Pilate asked confirmation from the centurion of whether Jesus was dead (Mark 15:44). A soldier pierced the side of Jesus with a lance causing blood and water to flow out (John 19:34), and the centurion informed Pilate that Jesus was dead (Mark 15:45). Joseph of Arimathea took Jesus’ body, wrapped it in a clean linen shroud, and placed it in his own new tomb that had been carved in the rock (Matthew 27:59–60) in a garden near the site of crucifixion. Nicodemus (John 3:1) also brought 75 pounds of myrrh and aloes, and placed them in the linen with the body, in keeping with Jewish burial customs (John 19:39–40). They rolled a large rock over the entrance of the tomb (Matthew 27:60). Then they returned home and rested, because Shabbat had begun at sunset (Luke 23:54–56). Matt. 28:1 “After the Shabbat, at dawn on the first day of the week, Mary Magdalene and the other Mary went to look at the tomb”. i.e. “After the Sabbath, at dawn on the first day of the week,…….”. “He is not here; he has risen, just as he said……….”.(Matt. 28:6) On the third day, which is now known as Easter Sunday (or Pascha), Jesus rose from the dead.